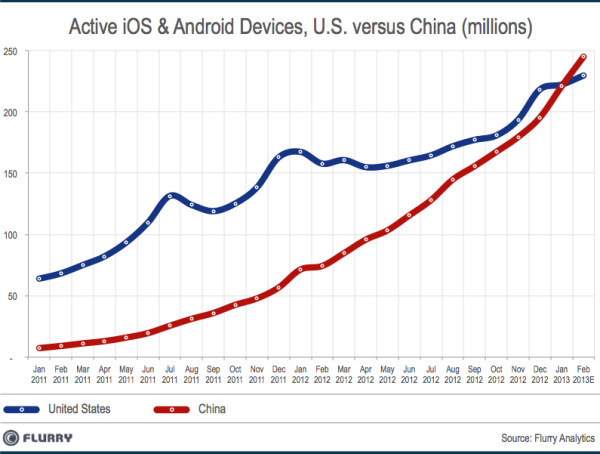 In February 2012, China became the source of the most new activations of iOS and Android devices. Now, just a year later, the country is set to become the world’s largest market for devices running Apple’s(s aapl) and Google’s(s goog) operating systems, period. As of the end of January, the U.S. and China were running neck-and-neck, 222 million to 221 million devices, respectively. But the way things are shaping up, Flurry Mobile feels comfortable saying China is set to emerge the leader at the end of this month, according to a new report published this week. By the end of February, China should have 246 million smartphones and tablets running iOS or Android; that will put it ahead of the U.S., which should have 230 million. The race is now effectively over: the U.S. will very likely never lead again, Flurry notes, thanks to the vast discrepancy in each country’s population — 310 million to China’s 1.3 billion. Flurry arrived at its findings by tracking 2.4 billion app usage sessions on more than 275,000 apps in use worldwide. This shift to China being the most important mobile device market in the world has been coming for a while, and it’s the reason, for instance, Apple’s CEO can’t shut up about China. That’s where the company’s main growth is going to come from. It’s why Tim Cook has gone there on official business twice in his two years as CEO, why the company has been on a tear opening retail stores in China, why it started accepting Chinese yuan for App Store purchases and why it’s offering no-or low-interest payment plans for iPhone purchases in the country. And yet, it still has to contend with the formidable Android: iOS device sales, while growing, remain far behind the sales of Android devices from Samsung, ZTE, Yulong, Lenovo and Huawei in China. What took China – with more than 4 times the population of the U.S. – so long? What the heck.. now it’s over.